Anna was fascinated by the hierarchy of the ant world.. Simply gorgeous Kathy! I love how the character is observing the hierarchy - very creative apporach!! I absolutely love your style...soft and subtle, but powerful! Sorry I missed your entry for last week's topic, theater...it was brilliant as well! Great use of color all around! 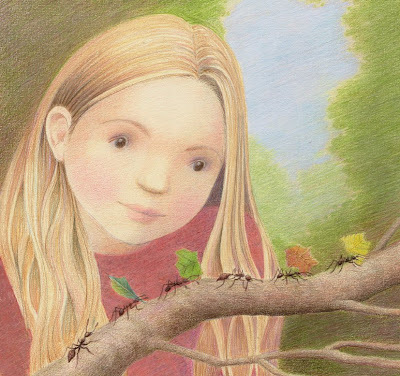 I like her tender gaze to the ants. Ants really have a very hierarchical social structure. Good idea for the topic! I was always fascinated by the ant world as well, and by your beautiful illustration. Good work! Just one word...Fantastic! OK well 2 words... Wonderful...well maybe 3... Forget the numbers.... another terrific work of art. I wanted to say what part of your illustration I liked best... but I can't ... It's all so GREAT! Kathy don't feel sorry for Esme as you see she is evolving. She like many of the young ones is able to determine the truth. Thanks for letting me use her. Wow, your work is wonderful, Kathy. Beautifully illustrated and so peaceful. Thank you for you kind comments regarding my first post! wow, this is truly amazing. great idea and wonderful illo. your blog is full of wonderful work, love your style! Wow!! Her skin tone is amazing, and just the overall flow of the picture, it's beautiful!!! I wish I could this with coloured pencil, this is lovely and a great take on illustration Friday!!! Oh I absolutely love the softness in her hair and face! I watched my little girl do this very thing today! This is so beautiful. I love her face and the way she watches the ants. I love your style and your colouring technique. And since I've missed some of the entries allow me to add that Impossibility is brilliant, and I love Talisman, with the clover in the foreground. Each piece you create tells such a lovely story! Just beautiful! I was fascinated by her hair! The color blending throughout the piece is very nice. Well done! Wonderful as always. I love your soft tones. The hair is beautifully done as well. You have captured such a sense of wonder in her gaze... as well as just a fantastic composition. What a lovely illustration--it so captures her wonder. I love the softness of the medium--colored pencils? The soft warm glow in all your pictures and it is quite captivating! Beautiful drawing, her face is captivating. I have a translate button, it's not perfect but better then just pictures? Beautiful illustration. Your work is fantastic. so lovely!! your work is so detailed i love it! This is such a wonderful concept showing a slice of nature that most of us don't think about. The softness of your work also comes through in your delicate, sweet characters. This would also be perfect for this weeks'word, parade! I just found your blog and have to say your artwork is amazing.